Former White House press secretary Sean Spicer made a surprise cameo at Sunday's Emmy Awards, sending up his infamous first appearance where he claimed President Donald Trump's inauguration crowd was the largest ever. After a lengthy riff on the current White House occupant during his opening monologue, host Stephen Colbert said one of Trump's chief concerns as president and reality television star was ratings. "You've got to have the big numbers, and I certainly hope we achieve that tonight," Colbert said. "Unfortunately, at this point, we have no way of knowing how big our audience is. I mean, is there anyone who can say how big the audience is? Sean, do you know?" Spicer then walked out with a special "Emmys" podium to roars and stunned faces in the crowd, including his Emmy-winning "Saturday Night Live" impersonator Melissa McCarthy. "This will be the largest audience to witness an Emmys, period!" Spicer said. "Both in person and around the world." That "really soothes my fragile ego," Colbert said, clearly mocking Trump. Spicer was mocked and criticized when he took to the podium one day after Trump's Jan. 20 inauguration and berated the press with the claim that no one had ever had a larger inauguration crowd than Trump. "This was the largest audience to ever witness an inauguration — period — both in person and around the globe," Spicer said with his voice raised. 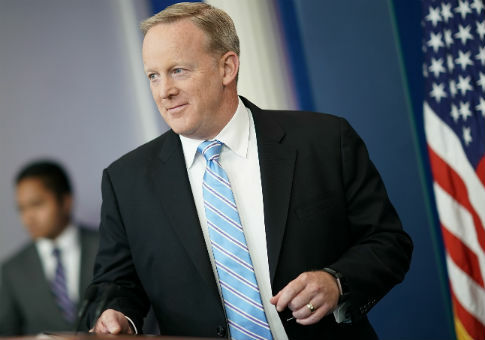 It was the first of many rocky interactions with the press before Spicer's resignation on July 21, making him one of the shortest-tenured press secretaries in White House history. This entry was posted in Politics and tagged Donald Trump, Sean Spicer. Bookmark the permalink.